My experience of inductions at new jobs is pretty poor. 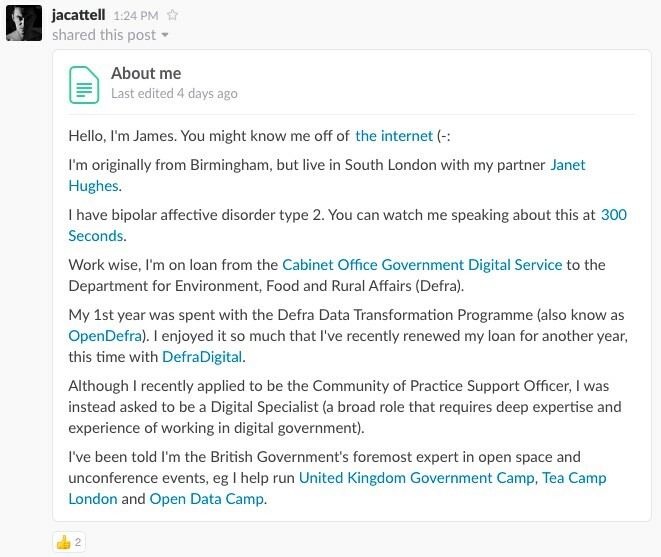 Until I joined the Enabling Digital Transformation (EDT) team here in Defra, I’d never had a job specific one. By this, I mean an induction for a new role, rather than about the whole organisation - which usually involves being talked at for an hour or 2. So I was pleasantly surprised when I joined EDT. But the rest I did myself. When I came over on loan to Defra, Government Digital Service (GDS) agreed to let me keep my laptop and smartphone. As GDS use Google Apps (including Gmail) I decided to use that email address to access all the services above. This also meant I could skip the “Create a Google account” step and be easily added to the EDT Google Drive. I’m now using 13 Slack teams, but manage them all in 1 place by using the desktop app. I also use the smartphone app, but only for a select few teams. You can read how we use Slack via former EDT team member Matt Jukes’s blog post Sharpening our Slack game. I’m a long time user of Trello and have an existing account which was easily added to the EDT board (which also meant I could skip “Add profile pic to Trello”). We’re fortunate to have the excellent Emily Webber in our team (which is part of the reason I joined) so we use her Tips for using Trello effectively. Even if you’ve used Trello for a while, I recommend having a read (I certainly learnt some new stuff). I had a good look through the calendar and added myself to the right meetings. 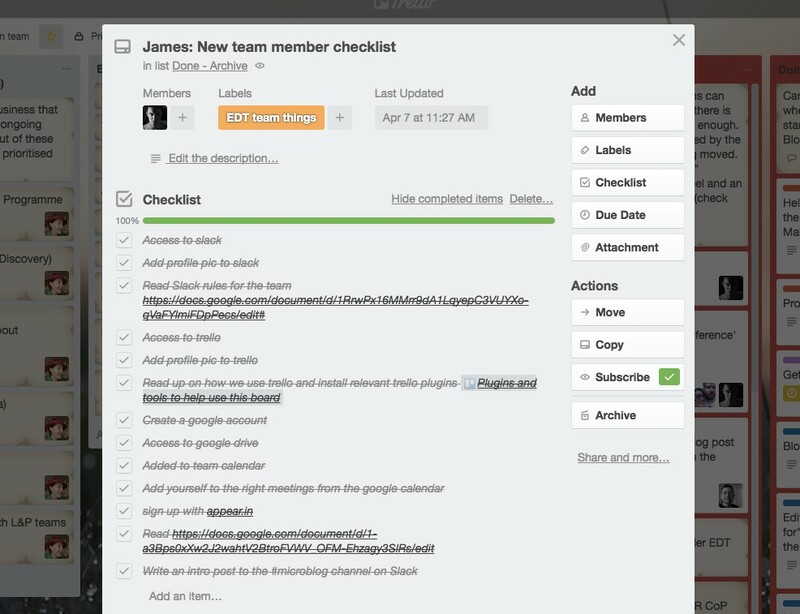 The main one is the daily standup which lasts 15 minutes and looks at the “doing” columns in our Trello board. Monday it’s at 11:00 and rest of the week it’s at 09:45. We also follow this with a 15 minute “Replenishment session” which allows us to replenish the “doing” columns from elsewhere on the board. We work in a bunch of different locations around the country, so use appear.in to do standups and other meetings. I prefer it to Google Hangouts, mainly because the interface is better and it’s quicker to access. The number of times I’ve sat on a Hangout waiting for everyone to join…. Yawn! The last but 1 step on the checklist is to read “EDT induction of sorts”. It covers high-level Defra stuff and explains where our team fits in and what we do. I particularly like the “Don’t Panic” section which explains what to expect during the 1st couple of weeks. All in all this way of being inducted appeals to me. It’s tailored to team, quick to do and gives you a hands on experience of the tools in use. It was particularly useful to understand how Slack was being used. But the best thing about this process is I didn’t have to cycle across town, sit in a room and roll my eyes. 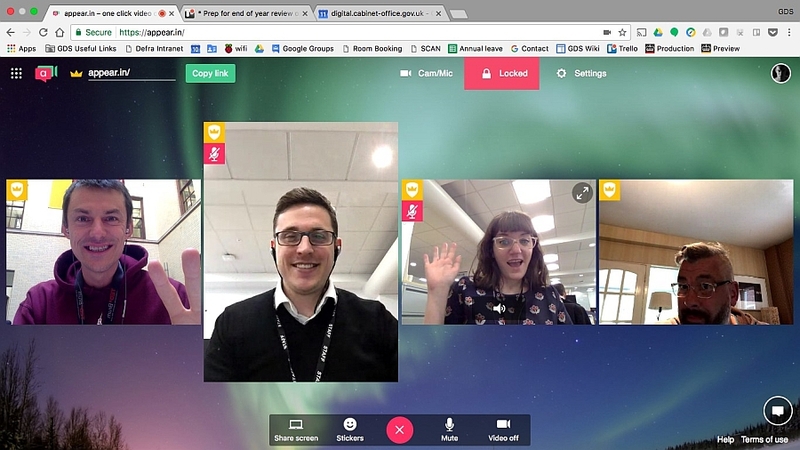 Well, I hope this gives you an insight into how modern digital teams in government work. If you have any questions or ideas, please leave a comment or tweet me directly. I’m @jaCattell.